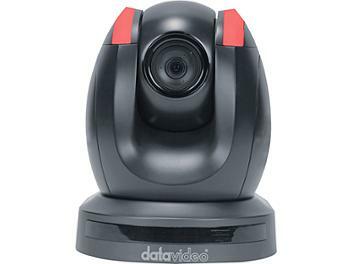 The black Datavideo PTC-150T 2MP Full HD PTZ Camera with HDBaseT, is suitable for medium to large venues such as lecture halls, auditoriums, houses of worship, and stadiums. The unit consists of the pan/tilt module, the camera head and lens, and a receiver box. The PTC-150T captures HD video in 1080i/p and 720p at up to 59.94 for compatibility with NTSC broadcast equipment, as well as 1080i/p and 720p at up to 50 for PAL compatibility. It can output HD via its SDI or HDMI connectors, and a composite (CVBS) connector outputs NTSC and PAL.